The high pressure system had moved westward and the frontal low southwards leaving the West Country bathed in sunshine and a forecast North East wind. David Day, the Race Officer for the last of this pursuit series set up the Ops room and the course from the club line start to St Just Buoy, Trefusis, St Just, Trefusis (all to starboard ) and finish. The spring tide was very low again, and many of us had to board the launch from Flushing Quay. Eight yachts started with Sweet Friday, Len Cheshire off first. He was followed by the two Folkboats, Aries and Aurora, David Mitchell and Mandy Owens. Trifle, Chris Jelliss was next over the line. We had noticed the tell tale signs of clear blue skies to seaward and cumulus cloud just inland indicating a sea breeze caused by the land warming up faster than the sea. The surface wind was East South East and so we went off the line on a starboard beat. The two GK24s were next to start Kaimana, Nigel & Jess Rowe with their new 13 year old crew Jack. And Wilkie, Bob Chapple. Tai Mo Shan, Neil Chamberlain followed by Minx, Charles Choak brought up the rear. 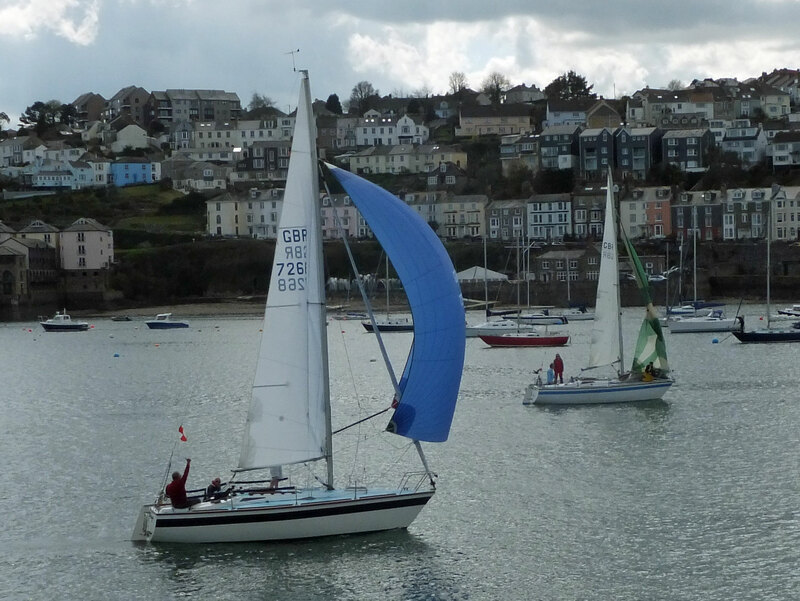 On Trifle we found it was an ideal Hunter Sonata wind and by the end of the moorings toward the Trefusis point we powered past the two Folkboats and the Moody 27 Sweet Friday into 1st place. The wind was veering and we decided to increase our lead by flying our spinnaker. Fourteen year old Finn Richards on foredeck had played a tough game of rugby in the morning and had a knee injury. We swapped places, he helmed and I took the foredeck with 10 year old Sonny Davies hoisting the spinnaker and pulling the guy rope. We looked back and had a commanding lead but saw the two GK24s gaining on the Folkboats. On Trifle we have two laminated cards for courses. One is for Tuesday nights and one is for Saturday Clubhouse starts. What day of the week is it? I was looking at the card! We rounded the St Just Buoy to port and did an epic spinnaker gybe. It was a bit shy to get to Trefusis so we dropped the kite and hoisted the genoa. We had sailed the wrong course! Curses. So we watched the fleet rounding the buoy to starboard so we had to go back and unwind ourselves and play catchup. There was a beat back to the Trefusis mark and the two GK24s rounded ahead of the fleet. Trifle managed to overtake Aries and kept ahead of Minx. A further spinnaker run to St Just saw the GKs get away from the fleet hotly pursued by Tai Mo Shan. The beat back up the harbour saw Trifle overtake Sweet Friday and Aurora still keeping ahead of Minx. Two hoots at the line and an S indicated 'shorten course' and finish. Kaimana was first! well done Jack, you certainly told Nigel which way to go! Wilkie came a very close second with Tai Mo Shan in third. Credit to Trifle? We came fourth and won a bag of peanuts! If only I could remember what day it was. The Sailtech Spring Pursuit series finished leaving Wilkie, Bob Chapple in a well deserved first place overall. Minx, Charles Choak in second overall and Kaimana in a very creditable third overall. Well done Nigel, Jess and now Jack in a new boat for this season. We retired to the club and Sue Clark provided us with superb cakes and tea. Jeanette Hill called the finish times in the ops room and processed the results. David Day relaxed after Race officer duties. Jack Penty took some video footage, posted on YouTube no doubt. Next week we start the Cockwells sponsored Saturday series and hope a few more yachts will join us for a great way to spend a Saturday afternoon. Jack Penty's video is here.